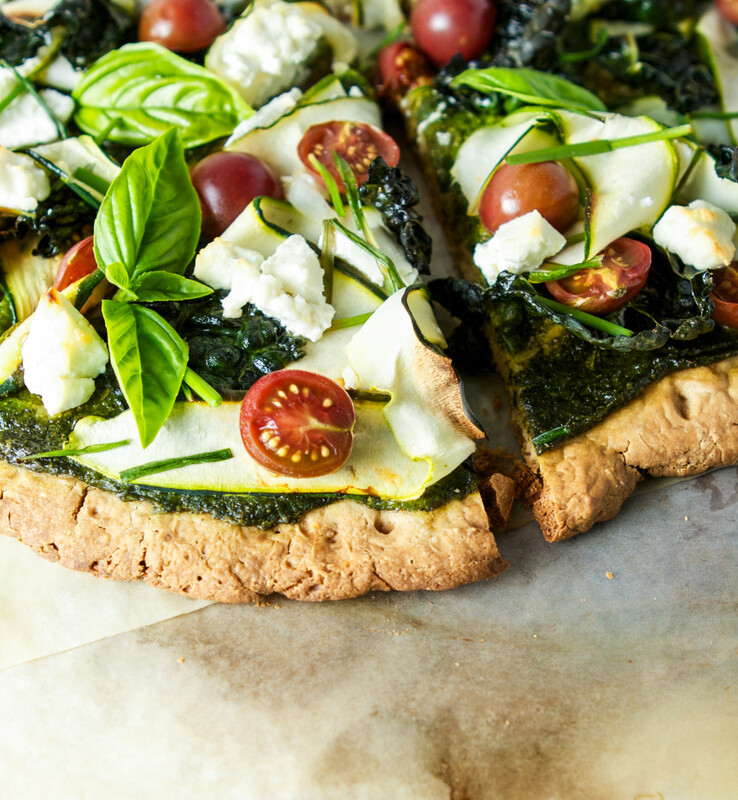 What better way to showcase summer’s bounty of vegetables than atop a chewy, crunchy (gluten-free) pizza crust that’s slathered in pesto and topped with goat cheese? The answer is simple. 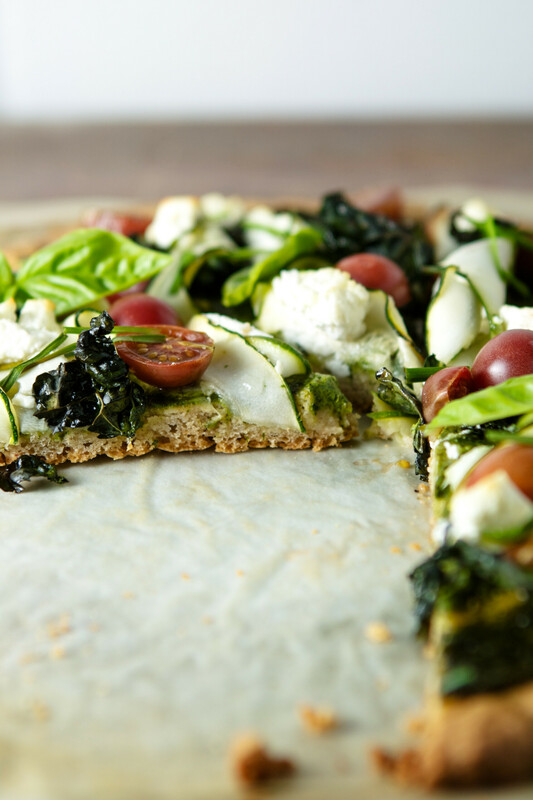 There isn’t a better way, and I guarantee you’ll love this gluten-free pizza. I was determined to create a gluten-free pizza crust that rivaled its cousin (you know, the gluten-riddle cousin). And I won’t sugar coat it, my first shot at it was pretty sad. Zestful Kitchen’s #1 taste tester and I both agreed that my first version of this pizza crust reminded us of a sugar cookie — sans the sugar, that is. With the texture and look of a cookie, all it needed was a drizzle of honey and we had ourselves a great midnight snack. I also prefer to use this gluten-free flour blend because it adds a unique texture unlike any other gluten-free flour blend I’ve used before. NuLife uses sorghum flour instead of a combination of rice flours, and the end product is more sturdy and toothsome than the alternative. 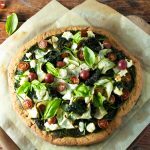 After a few tests and a lot of research, I found that borrowing a mixing method from America’s Test Kitchen resulted in a delicious, and easy-to-make crust. The dough is very sticky, and it may surprise you, but be patient and trust me, it turns out great. Thanks to a counter full of produce, there was no question what type of pizza this would be. I have basil growing out of my ears, zucchini randomly showing up at my doorstep, and kale taking up the majority of my refrigerator. So green goddess pizza it is. Mix and match whatever vegetables you have on hand, all I’ll say is that the pesto and goat cheese are non-negotiable. In a stand mixer fitted the paddle attachment, mix flour, non-fat dry milk powder, flax meal, salt, baking powder, and yeast on low speed until combined. Whisk together water, oil, and honey. With the mixer on low, slowly add water mixture in a slow stream until incorporated. Increase speed to medium and beat until dough is sticky and uniform, about 6 minutes. It will resemble a thick, sticky batter. Remove bowl from mixer, cover with plastic wrap, and let stand at room temperature until dough has slightly puffed and inside is bubbly, about 1½ hours. Adjust oven rack to middle position. Cover a baking stone with parchment paper and coat thoroughly with nonstick spray. Transfer dough to center of parchment paper and spread into an 8-inch circle using a greased rubber spatula. Thoroughly coat top of dough with nonstick spray then lay a large piece of plastic wrap over top of dough. Using your hands, gently press dough into a ¼-inch-thick, 11- to 12-inch round, leaving outer edge slightly thicker. Carefully peel plastic wrap off and discard (if it pulls on the dough, that’s OK, just gently press dough back to fill in any holes, it’s forgiving). Place baking stone in oven, then heat oven to 325°F. 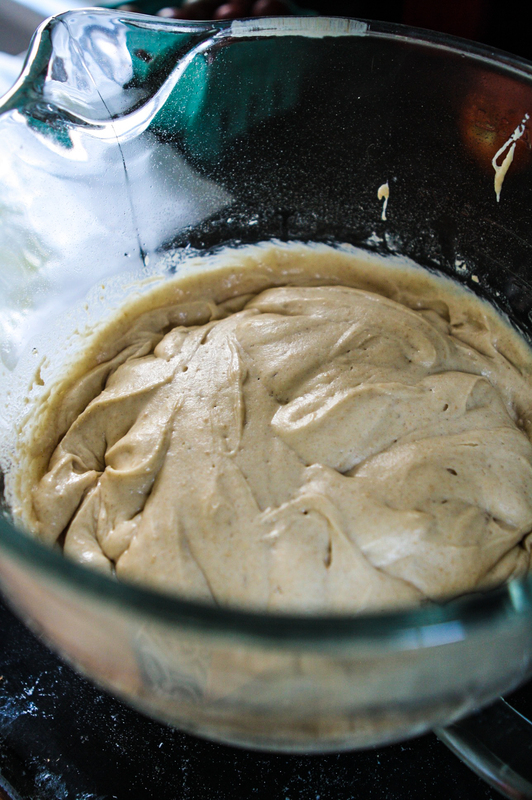 Bake dough until firm, golden brown on bottom, and starting to brown on top, 55­–60 minutes, rotating pan halfway through baking. Remove baking stone from oven and let crust cool slightly, increase oven temperature to 400°. 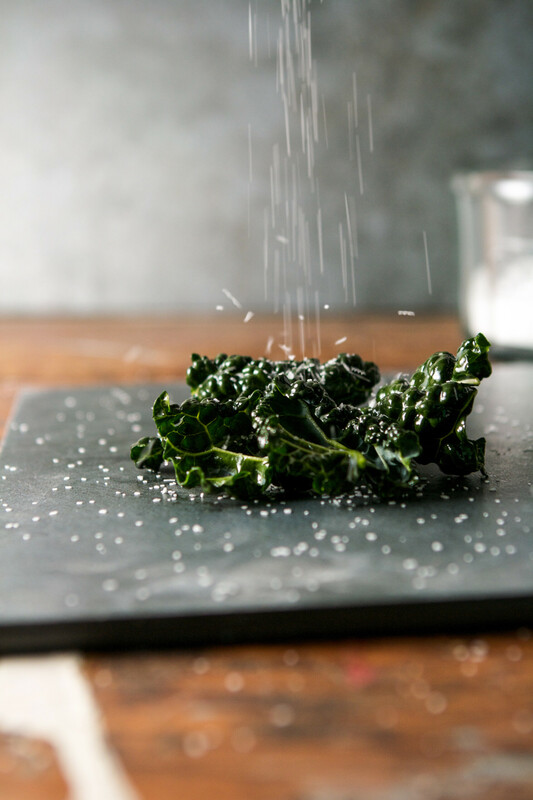 Combine kale and 1 teaspoon oil, season with salt and gently massage to coat and slightly tenderize. 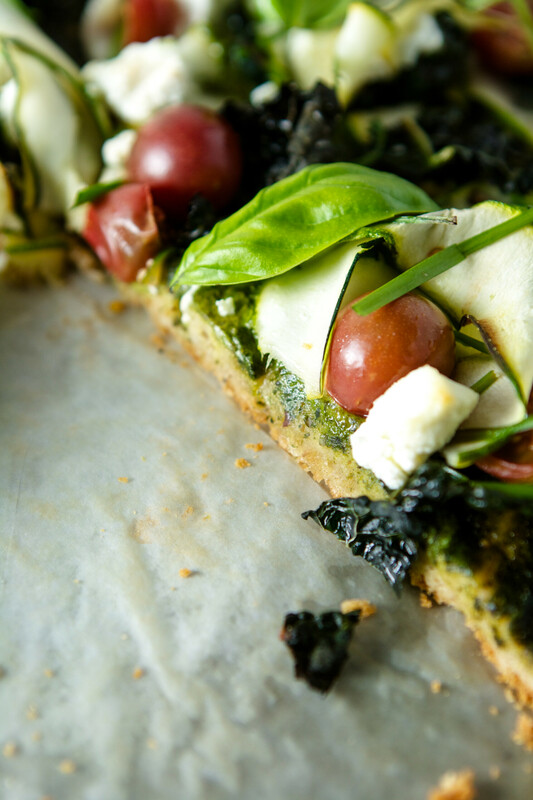 Spread pesto in an even layer over crust leaving a ¼-inch around the edge. 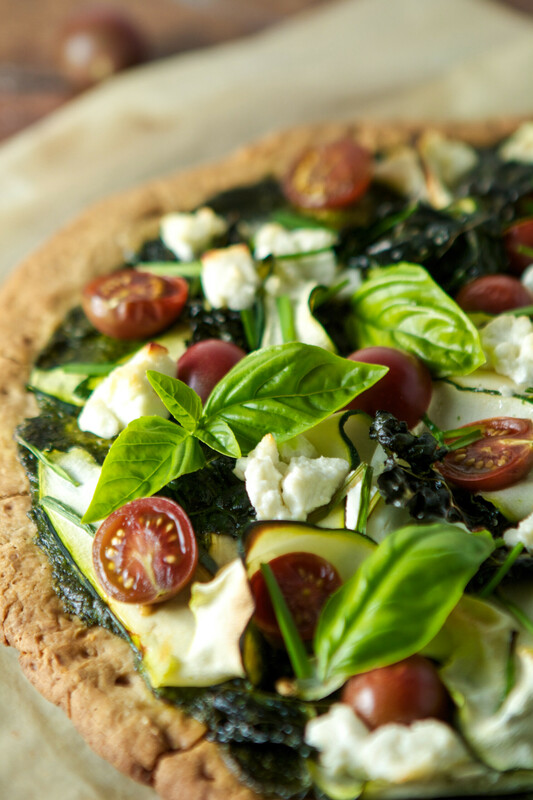 Arrange half of the goat cheese over the pizza then top with kale, zucchini, tomatoes, and chives. Top with remaining goat cheese, drizzle lightly with olive oil and season with salt and pepper. 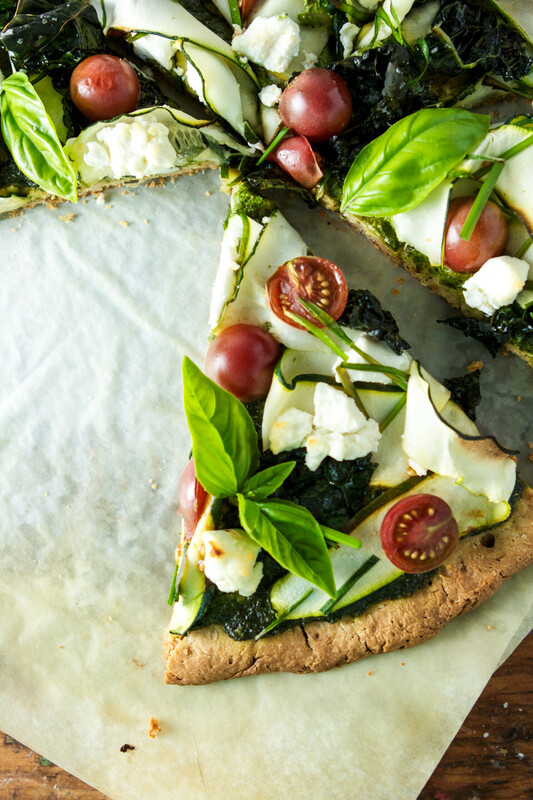 Bake pizza until vegetables have wilted and cheese is starting to brown, 20–25 minutes. Top pizza with fresh basil, slice, and serve. Prep time does not include the hands-off rising time of 1½ hours. 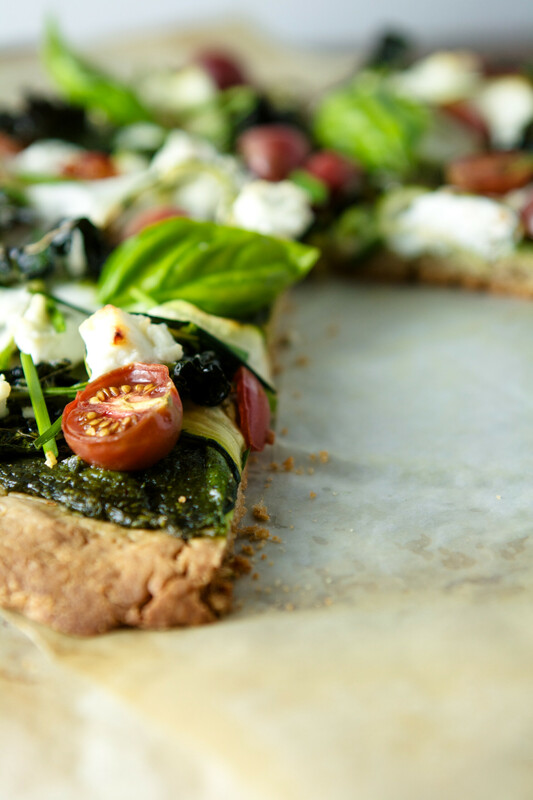 Love the idea of a green goddess pizza but don’t want it to be gluten-free? 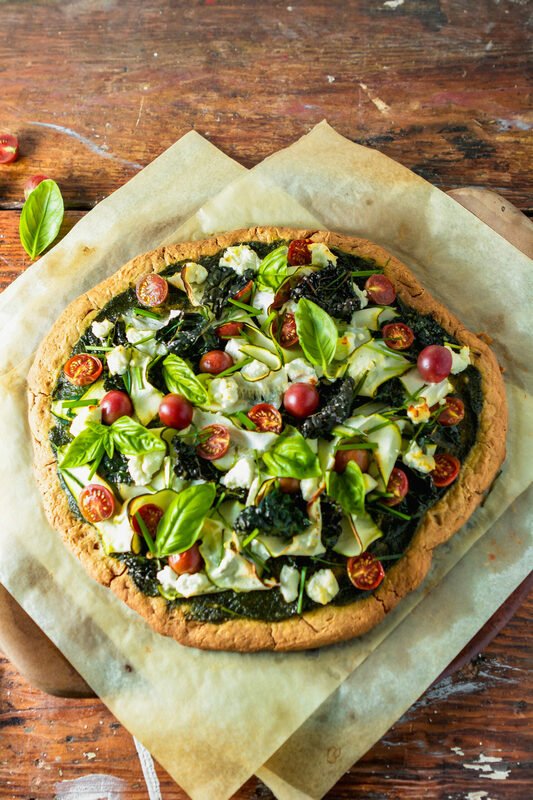 Simply use your favorite recipe for homemade pizza dough or purchase some fresh dough from a local grocer or Italian restaurant. 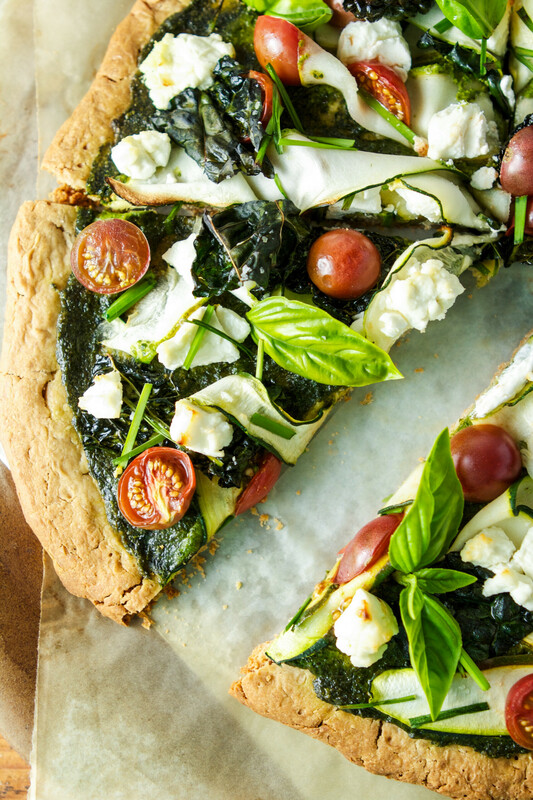 This pizza looks divine! 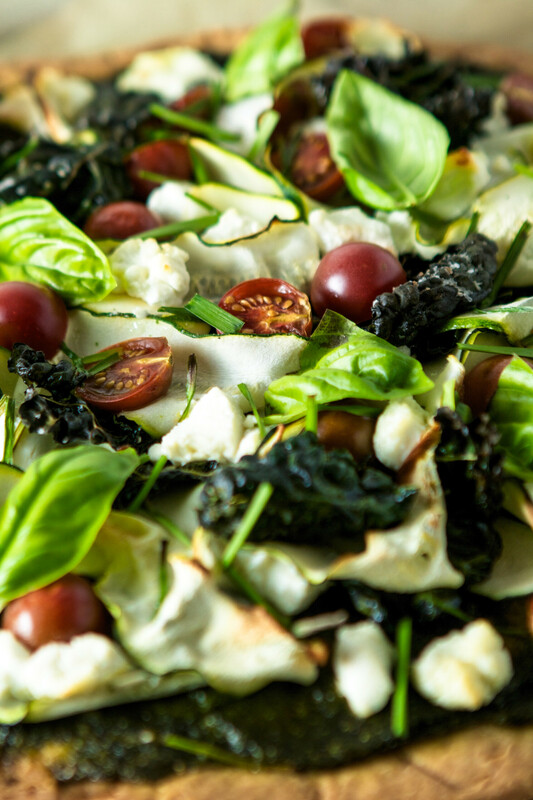 Love that fresh basil – it pops in the photo! Thank you! My basil plant is flourishing and I’m finding every possible way to use it!